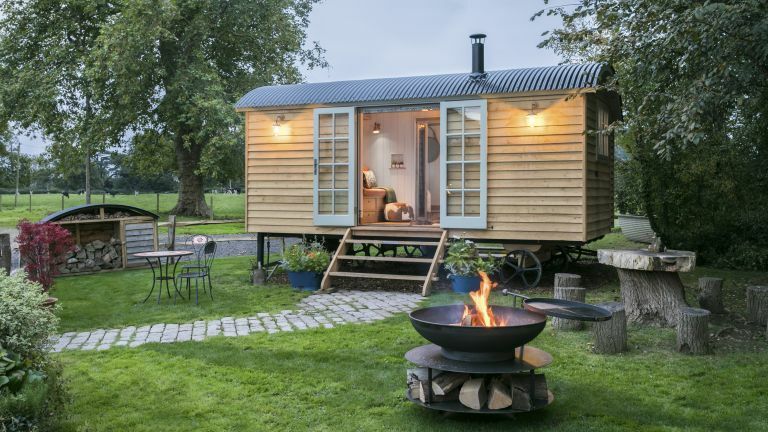 With warmer weather on the way, Somerset-based Blackdown Shepherd Huts and Dorset’s William Holland Baths have teamed up to create the ultimate glamping experience; meet the Brace shepherd's hut. A stylish mix of old and new, the shepherd hut is handcrafted from oak by skilled West Country artisans to heritage designs, yet is kitted out with all the latest home comforts and luxurious fittings. The perfect year-round garden hideaway for two, the space boasts a log burning stove, a handcrafted kitchen with copper worktops and is finished with brushed nickel fittings and vintage style radiators throughout. Added into the mix are vintage style shutters and a stunning bedroom feature wall, which all combine to create a on-trend modern vintage look to rival the most boutique of hotels. However, the real ‘piece de resistance’ can be found through the glazed walkway into the bedroom where the William Holland pure copper Bateau roll top bath takes centre stage. Raised on a stunningly lit platform, this luxurious touch is the ultimate in glamping chic.